In a symbolic warning about how close the world stands to suffering a nuclear catastrophe, the Bulletin of Atomic Scientists has moved the Doomsday Clock closer to midnight. The existential threat now poses a greater danger to humanity than at any time since the height of the Cold War. The standoff between Russia the US, the world’s biggest nuclear powers, as well as regional conflicts and the threat of terrorists getting their hands on nuclear material, can all lead to disastrous consequences. With global politics growing more unstable, are nuclear arms still the strongest deterrent to global war, or are they the biggest menace to the security of the world? And, with a new president in the White House, how will America’s nuclear arms policy evolve? We ask former US Secretary of Defense Dr. William Perry. 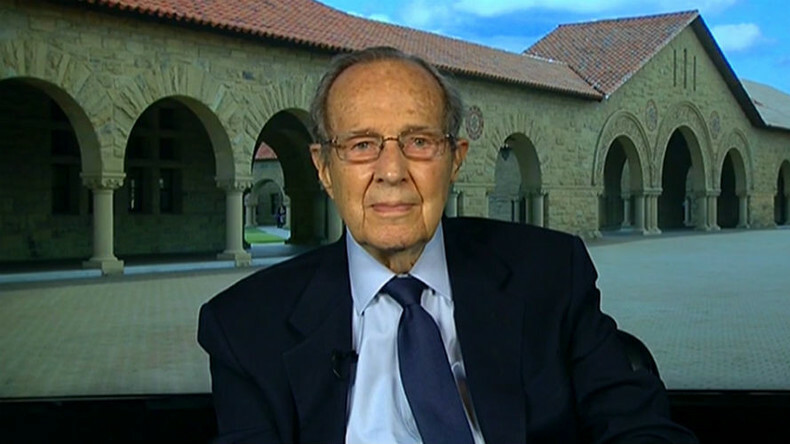 Sophie Shevardnadze: Former US Secretary of Defense, William Perry, welcome to the show, great to have you with us. Mr. Perry, I remember, ten years ago at the Munich security conference, President Putin warned of growing global instability - wars in the Middle East, NATO expansion and a nuclear arms race. This was a decade ago - why have things got only worse during this time? William Perry: I think, both the US and Russia have found themselves engaged in a war of words. Rhetoric has been increasingly belligerent, and also, military buildups and threats of military buildups. I think that has put us on a dangerous path, and I'm hoping that President Trump and President Putin will be able to find a way of getting us out on a safer path, relevant to the security of both of our countries. SS: President Trump has called for the expansion of America’s nuclear capabilities on one occasion, on another he’s called for reducing nukes ‘very substantially’ - so which is it going to be? WP: I think, we won’t really know what President Trump is going to do on defense issues, on security issues, until he submits his first defense budget in a few months. Then we will see whether he’s willing to spend additional funds for defense, which will compete, of course, with other pressures of the economy - and particular, what he will do relevant to the nuclear weapons. I think, on the nuclear weapons, he has said he’s going to maintain strong military, but that very much depends on what Russia is doing on nuclear weapons. There’s a possibility for both Russia and the US to increase spending on nuclear weapons, which seems in the direction we’re heading now. Not only that will be costly for both countries, but also dangerous for both countries. There’s a distinct possibility that President Trump and President Putin can decide in the interest of both our nations to decrease the emphasis and decrease the spending on nuclear weapons. That not only will allow both countries to improve their economy, but I think, more importantly, it will lower the danger for both counties. SS: You keep warning people that the chance of a nuclear crisis is greater now than it was when you were Clinton’s Defense Minister. But false alarms happened then, too, and it didn't lead to nuclear war - what is different now? WP: What is different now is that, besides the danger of a nuclear war, there’s a danger of either US or Russia miscalculating or blundering into nuclear war. Quite clear to me that neither country wants a nuclear war and will deliberately start a nuclear war. The danger now is the same as the danger in the Cold War, that we will blunder into a nuclear war, as we almost did, for example, during the Cuban Missile Crisis. But beyond those dangers, which are like the dangers of the Cold War, there are new dangers: one of them is a possibility of nuclear terrorism and of course, the nuclear bomb set up by a terror group could go off in Moscow or in Washington or in New York or in Saint-Petersburg - so that danger’s new, it didn't exist during the Cold War. Beyond that, there’s a danger of regional nuclear war, for example, between India and Pakistan. So, there are new dangers that didn’t exist during the Cold War. So, the danger of some kind of nuclear catastrophe is greater than it was during the Cold War. We can do many things to reduce those dangers, but what’s really important is for the United States and Russia to understand that these nuclear dangers are a danger to both of our countries and find a way of working together to lower the dangers. SS: According to an Associated Press report, the personnel who man America's nukes are poorly trained and have to use retro tech to run the systems - including 8-inch floppy disks. Why neglect maintaining their nuclear deterrent? WP: I think those accounts are exaggerated, but I am concerned that both in the United States and Russia that the people who have been manning nuclear sites for many-many years now don’t have the motivation or perhaps even skills to do it properly - so, that’s one of the reasons for finding a way of lowering the dangers.. Particular, I put a great emphasis on a danger of our ground-based missiles, ICBMs, intercontinental ballistic missile because they are the danger of an accidental war starting - that is, if either Russian alert system or American alert system makes a mistake and falsely indicates an attack on the way. then there’s an emphasis on either President to make a rapid decision to launch his ICBMs before the other side’s ICBMs will land, and of course, if his alert system is wrong, if there’s a false alarm - then that President would’ve accidentally started a nuclear war. Now, this is not some academic possibility - there’s been at least 2 false alarms in Russia that I know about, and at least 3 false alarms that I know about in the US. That’s a very serious consideration. This is not likely to happen, it’s low probability, but it’s a low probability of an outcome that will be truly catastrophic. SS: Now, you’ve mentioned nuclear terrorism. After last year’s terror attacks in Brussels there were reports that terrorists are trying to infiltrate Belgium's nuclear facilities. Belgium is also one of the European locations for American tactical nukes - with the growing threat in Europe, are American nukes becoming a potential target? Are they sufficiently secured? WP: I believe the danger of nuclear terror attack does not come from terror group getting either American nuclear weapons or Russian nuclear weapons, because security for both of them is very-very good. The danger is that the terror group could get the fissile material, the fuel, highly enriched uranium, and if they could get that, if they could buy it or steal it - and this is not as well protected as weapons are - then, they could themselves make a crude, improvised nuclear bomb. Crude, but still quite effective. It then can be delivered in a missile, it could be delivered in a delivery truck, and if they could do that, then there’s a danger of nuclear bomb going off in Moscow or in Washington. So, United States and Russia have this common danger, this common threat and we should be working together to do everything we can to lower the danger of a terror group getting either bomb or even a fissile material from which you can make a bomb. SS: So you don’t see a danger in a terrorist group infiltrating a nuclear facility? WP: I could never say that’s impossible, but I’d say that’s a much lower danger than the danger of terror group getting the fissile material. That means that we should focus on the risk that is the greatest, and that, to me, is the greatest risk we’re facing today from a terror groups. SS: A Pentagon advisory board proposed building smaller nuclear weapons for ‘limited use’ - but are the smaller yields and better targeting also making nukes more tempting to use? Even to use first, not just in retaliation? WP: I am totally opposed to any emphasis on so-called “tactical nuclear weapons”, I think that’s very dangerous. Either in Russia or in the US, the thought that because the yield is lower that the danger of a nuclear war is lower - is, I think, invalid. Once one side uses a nuclear weapon, even if it is a so-called “tactical” nuclear weapon, there’s no guarantee that we will not escalate into a general nuclear war. So, to me, it is very dangerous assumption to believe that you could use lower yield nuclear weapons without escalating into a general nuclear war. By the way, the so-called lower yield nuclear weapon is still many kilotonnes - so, we’re still talking about an explosion with devastating consequences. So, in sum, I am opposed to tactical nuclear weapons, and I’m very doubtful that the use of a tactical nuclear weapons will not, in fact, escalate into a general nuclear war. SS: Now, you’ve mentioned India and Pakistan - what would be the consequences of a regional nuclear war? WP: We have to define “limited” very carefully, because both India and Pakistan have more than a 100 nuclear weapons, perhaps 200, and if they use even half of their arsenals against each other, on the cities - there will be tens of millions of casualties in India and Pakistan. So, it will be a really catastrophic event. Beyond that, the dirt and the fumes from the fire in these cities will go to the atmosphere and change the composition of the atmosphere, probably lowering the temperatures around the planet, for one or two degree. That, in turn, could cause widespread crop failure and so the effect would not only be profound on India and Pakistan, but actually, unlimited nuclear war of that magnitude could affect people all over the planet. SS: Both Democrats and Republicans alike are vehement about keeping up the confrontation with Russia, despite Trump’s conciliatory mood. Sometimes this stance goes a bit off key - like when Congresswoman Maxine Waters scolded Putin for invading Korea. How knowledgeable are the people who make decisions on these policies, can they be trusted to steer it the right way? WP: We have to trust our leaders: they are our leaders and they are going to be for years to come. On one hopeful note, I believe, is that President Trump says very explicitly - he wants to have a dialogue with President Putin. I think that would be very positive, if that happens. In my judgement there are many issues between the US and Russia which would be very difficult to resolve, but the issues of nuclear weapons... We should be able to discuss and come up with actions that are mutually beneficial. The danger of a nuclear terror group is to both countries, nuclear bomb can go off in either Moscow or Washington. The danger of nuclear proliferation is for both countries. So we should be able to find it possible to work together to reduce the dangers to both of us, even though that we cannot work on issues that we disagree, we've ought to be able to work together on issues on which we agree, and President Trump has made it very clear that he would like to do that, and so I think there's possible opening here after years of no constructive dialogue between the US and Russia on nuclear issues - and now, it's a possibility that we will have that dialogue. I, very much, look forward to that. SS: Trump’s proposed easing of sanctions for good deals with President Putin - like a nuclear arms reduction treaty. Will he be strong enough to overcome the opposition from his own administration to “making deals” with Putin? WP: I don't have any ability to forecast what negotiation tactics that President Trump might use with President Putin. The extent to which sanctions, for example, would be on the table? I believe, from what I hear and understand that President Trump will be willing to put everything on the table and so there's the possibility of a new beginning, a new opening in negotiations which could be constructive for both countries. Both President Putin and President Trump will be wanting to advance the cause of each of their own nations, but in the case of nuclear dangers, it is a mutual interest between the US and Russia to lower those dangers. So, there's an area, where, I think there's every possibility of being able to lower dangers. I must say, though, that for success in this area, the two leaders have to be able to do what I would call "separate the variables" - that is, have to be able to separate out issues on which they cannot agree, which is basic disagreement, from the issues that they do have common interests and can agree - so not let the issues where they disagree get in a way of coming to agreements on the areas where they agree. SS: What makes you think this piecemeal approach to diplomacy will work? WP: I'm not sure it will work, but I said, 'can work', and we can hope that the two leaders will find a way of making it work. Even if we cannot agree on Ukraine, even if we cannot agree on Syria - we ought to be able to agree on nuclear dangers to both of us, to both of our countries. We ought to be able to agree on taking actions and steps to lower those dangers. Those are in the interest of both countries, there's no conflict there. They don't have to be able to agree on everything to agree on something, and particularly to agree on something that's very important to both of us. SS: Today thousands of NATO troops are amassed close to Russia’s border - in the biggest military buildup since the Cold War, already spurring an arms race - is anybody realistically planning to go to war with Russia? And if not - because I don't think anyone is - what’s the point of this military buildup? What's your take? WP: I'm very clear that NATO has no plans or intentions of going to war with Russia. That's the last thing anybody in NATO wants. The purpose of the troops there are for better or for worse - the purpose of the troops there is to deter Russia from taking any military action against the Baltic nations, for example. Have Russia not intended to do that, those troops don't need to be there. In fact, as far as NATO is concerned, they'd rather not have to deploy the troops there. So, one of the thing - besides coming to the agreement on nuclear issues, that possibility that President Putin and President Trump have - it also will be very good to talk about what they can do, to lower the tensions in the Baltics, and, in particular, have both Russian troops move away from the border and have NATO troops move back. That would be, I think, beneficial for the security of both countries, if they get agreed to do that. SS: But Moscow, you know, Moscow has said time and time again that it finds plans to put a missile defense system in Europe unacceptable, and that it will deploy more missiles in response, take other retaliatory steps - why are Western leaders so eager to push this system through even though they know perfectly well it will only lead to more tension and escalation in Europe? WP: I must say that I, myself, believe it was a mistake for the US to deploy the ballistic missile defense systems in Eastern Europe. I do not believe that the systems we have deployed there in any significant way threatens the Russian nuclear deterrence. It is much too small and the Russian nuclear deterrence force is much too large. But I can see, and I know talking to many Russian colleagues, I can see that that deployment is a concern to Russia. That, again, seems to me as something President Putin and President Trump ought to be able to discuss. The idea of the United States backing away from, reducing at least, the emphasize on the ballistic missile defense system in Europe, or, maybe, make some sort of assurances about not building up that capability in way that would threaten Russia - if we can come to some kind of agreement like that, that would also be a benefit to our securities. I do not know whether President Putin and Trump are going to discuss that issue. It seems to me as an issue open for discussion and one which is a possibility for making some agreements that could improve the securities of both of our countries. SS: But, you know, the thing is that, unfortunately, the Russians and the Chinese, they don't buy when Washington says that missile defense 'is not aimed' at them. I mean, how can the US convince Russia or China that it doesn't have hostile intent, if that's true? WP: It's very difficult to convince another side of your intent. On the other hand, it's very straightforward to determine the capabilities, and it is quite clear that the ballistic missile defense system deployed in Europe has virtually no capabilities against the Russian nuclear deterrent. The Russian nuclear deterrent is too large, too powerful, to widely dispersed geographically to be significantly affected by it. I do understand the Russians consider it an affront to put that kind of a defense system too close to their borders. But, in fact, the technical people in Russia as well as the technical people in the US understand that Russian nuclear deterrence is far too big and far too capable to be significantly affected by this defense system. SS: Trump took some heat after he called NATO ‘obsolete’ - but he’s specified it’s because the alliance is not fighting terrorism. While countering Russia in the Baltics is aimed at a hypothetical threat, the growing threat of ISIS, terrorism in Europe and the US are real. In response to Trump’s criticism, NATO members are already promising to up their defense spending - will Trump be able to breath new life into the alliance, make it focus on a threat other than Russia? WP: I cannot forecast what Trump's actions on NATO will be based on what he has said so far. There's a real possibility, though, of improving the capabilities of NATO relative to very real and very significant terrorist threat. And that, to me, seems what the direction of the improvements should be. SS: General Mattis nicknamed ‘Mad Dog’ is a fan of ‘continued American engagement in the world’, while Donald Trump really is not - how do you see that contradiction playing out? WP: In the US, of course, the President has the final say on national security decisions, but he is profoundly influenced by his Secretary of Defense recommendations, and I know General Mattis very well, he's an intelligent, temperate, thoughtful person. He, I think, will be a strong and stabilizing influence in the Defense Department. By the way, the term "Mad Dog" is something he himself is very unhappy with, and that does not in any way actually describe the person, who is really quite temperate and intelligent. I think that General Mattis, Secretary Mattis, will be a positive and a constructive and a tempering influence on President Trump. He will offer sound advice, which, I think, will be in the direction of more security and more stability in the world. SS: I want to talk a bit about Iran's nuclear deal. This deal with Iran was Obama’s top success. The Trump Administration imposed new economic sanctions on Iran, the President has repeatedly criticised the Iran nuclear deal and wants it renegotiated. It’s a multilateral agreement, it took years to negotiate - will Trump be able to rewrite it? What happens if the US drops the deal altogether? WP: I do not believe that dropping the Iran deal is a good idea. I do not believe we can re-negotiate Iran deal. It's a multilateral negotiations, it took the action of many countries, including the United States and Russia, countries in Europe, China, to get that agreement. So, re-negotiating this, I think, is quite unrealistic. Dropping the agreement, I think, would be a very big mistake. I would hope that President Trump, as he studies that problem, will come to more temperate view on how to deal with the Iran nuclear agreement. General Mattis has recommended to him that we not drop the nuclear Iran deal, and I hope that recommendation will, in fact, prevail, as we go forward. SS: Dr. Perry, thank you very much for this lovely interview. We were talking to Dr. William Perry, former US Defense Secretary, discussing America's military posture under President Trump and the dangers nuclear weapons pose in today's world. That's it for this edition of SophieCo, I'll see you next time.